Residents in Wigan have reported a large police presence and a fire engine on a street in Wigan this afternoon. Three police vehicles and a fire engine can be seen at Peter Street, Golborne, which has been cordoned off along with other surrounding avenues. The responding teams have also been seen lining up on Heath Street, a main road which runs adjacent to Peter Street. 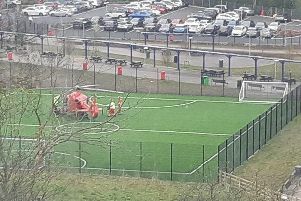 Little is known as to why emergency services have been called out to the scene, but one passerby who managed to capture the events told Wigan Today that they saw a drone hovering above the area, which they believed was being used by police. The resident, who wished to remain anonymous said: "Nobody knows what is going on, but people are being told not to go near the area. "From where I was stood I saw a drone hovering in the same spot on Peter Street, and it has been there a while now and it looks like it is recording something."